There’s always a danger with movies that self-consciously restrict themselves – be it sticking to one location, or a minimal cast – that they become little more than formal exercises. Alternately, they can end up seeming over theatrical (since they adapt or adopt conventions of the stage) or they really should have been a short film and struggle to reach feature length. Phone Booth is one such example; in and of itself entertaining but the high concept keeps hitting you in the face. On the other hand you never question the close-quarter intimacy of My Dinner with Andre, so fascinating is the conversation. Locke comes with the “an exercise in limitations” strapline leading the way; an entire movie set in a car, with its protagonist talking down the phone? That’s asking for trouble. And yet, because writer-director Steven Knight eschews (nearly) anything that would invite disbelief (this is very much not “Die Hard in a BMW”) the 90 minutes play out with remarkable conviction. Knight’s maligned directorial debut Hummingbird made little attempt at anything approximating reality; the Stat as an Afghanistan veteran, happening across a luckily vacated luxury apartment, righting wrongs while befriending a nun. I quite liked it in a daffy kind of way, but it wasn’t a patch on some of his earlier scripts such as Dirty Pretty Things and Eastern Promises. Locke might have the visual sheen of those thrillers, but it is very much a concerted change of pace and genre. Which doesn’t make it Mike Leigh either. Cinematographer Haris Zambarloukos commented that his approach was to treat the car like a spaceship and he arrives at an elegant, seductive look; lights, reflections, and tracers glow as near-close encounters or flash by as Locke speeds through the night. The effect on the viewer is hypnotic, even as Locke is trying to keep a lid on the multiple traumas vying for his attention. His world is hermetically sealed, strangely still, but it’s only his controlled, measured responses to each situation that insulate Locke from the spiralling hysteria that follows his choice. Hardy is Ivan Locke, the foreman on a Birmingham building project. On learning the woman he slept with seven months before has gone into labour, he gets in his car and heads for London to attend the birth. This means he won’t be home for the football match his wife and two sons plan to watch with him. More crucially, it means he won’t be there for the next day’s concrete pour, the biggest pour in Europe outside of nuclear and military facilities. The reaction from his colleagues is one of understandable meltdown, and he must juggle calls with his boss, a junior, his sons, his wife (to whom he admits to his infidelity, which only serves to up the ante), the soon-to-be mother of his child and various others who stray into the various messes. The camera is on Hardy (who, more practically than method-ly, had a cold during shooting so incorporates it into the character; so much more than mere prop acting) throughout, and he’s so mesmerising the initially disorientating Welsh accent is forgotten in minutes. True, there’s a moment’s alarm; just what has he done? A whole movie featuring Dad’s Army’s Mr Cheeseman? Yet his choice is an astute one; Locke’s dulcet tones imbue a necessary calm because, as he repeatedly assures himself, he has to keep a level head while around are losing theirs. 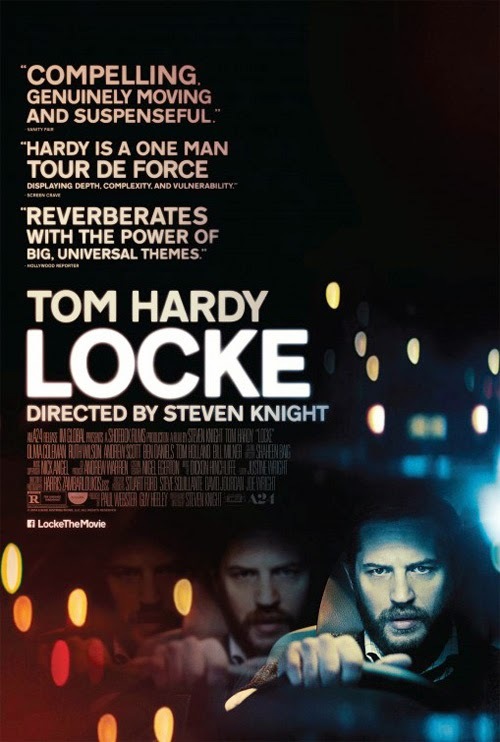 Knight navigates the warren of different demands on Locke’s attention with consummate skill. This barrage is believably established, so the trick is mostly keeping them in motion. The most mundane-sounding of professions becomes, if not interesting, fraught and demanding. Locke’s wife understandably freaks out at the news of his cheating, while his one night stand is a lonely soul who needs constant reassurance and emotional validation he cannot provide. Locke’s only weapon in the struggle he faces is reacting sensibly and with empathy. He can’t achieve anything by flipping out himself since so much is beyond his control in this environment. Locke’s also a sympathetic character; even his indiscretion was not done out of lust so much as feeling sorry for someone after he had too much to drink. He is contrite over his mistake (“I have behaved not at all like myself”) and confronts it rather than running away from it; his desire to avoid comparisons with the man his father was means he wants to be in the picture for his child. He prioritises this over his job, and few would disagree with this decision. He’s much more out of his depth in dealing with his wife, whom he has unsurprisingly put off coming clean to previously (so he confronts matters when his hand is forced, but he confronts them nevertheless). In the moment, Locke is aware that all the repercussions will have to be dealt with as they arise because morally he is quite certain that what he is doing is right (“This is the decision I have made”). Trying to find excuses now is pointless; “Because I’m not sick” is his response to the suggestion that things would have been so much simpler if he had just told his bosses he was unwell on the crucial day. We can only admire him for keeping his cool, and quite believe him when he says, “I’m going mad inside”. The daunting logistics of filming on the M4, with the supporting cast live on the other end of the blower to Hardy, are surmounted seamlessly. I didn’t know the supporting performers until the credits, so they were a number of “Oh, of course!” moments of recognition. Olivia Colman as fling Bethan, and Ruth Wilson as wife Katrina are outstanding. Andrew Scott, overwhelmingly irritating as Moriarty in Sherlock is quite superb as out-of-his-depth Donal, asked to stand in for Locke on site and getting through it as he can (“So, that is cider you’re drinking”). Ben Daniels (House of Cards) is also very good as Locke’s despairing superior. There are a couple of issues; while it’s quite believable that Locke would be talking to himself, the decision to fill every gap between calls with an imaginary conversation with his deceased father is unnecessarily lacking in trust for how well the piece holds together; we already know his motivation in that regard, and any number of different choices would have been more successful (even silence). There’s also the question of why, given the numerous possible problems (which do transpire) in respect of this massive job, Locke was going home anyway. Doubtless this could have been explained in a line or two, but as it plays Locke either had misplaced confidence that he could sort everything out when he got there in the morning or Knight hasn’t quite thought things through. Knight's film is a fine character study and Hardy, quietly and confidently, dazzles. He disappears into Locke’s unassuming resolve, eschewing the physicality and emotional heft we’ve come to associate with him. Knight has also tackled many and varied genres, but this feels like a significant new string to his bow. As a director he now looks like someone (with all due credit to the other departments, notably Justine Wright’s editing and Dickon Hinchcliffe’s score) all set to join the ranks of those illustrious peers who have successfully made the transition to multi-hyphenate.